If your week has been anything like mine, you’ve been finding every way possible to take advantage of absolutely gorgeous weather! Over the weekend I spent more time outside than inside, and I couldn’t have asked for better weather to kick off my much needed Spring Break with. Both Saturday and Sunday it was sunny, in the 80s, and very low humidity. The weather for the rest of the week isn’t supposed to be as warm as its been this past weekend, but since we’re not traveling this year for Spring Break you can bet that I’ll be outside every possible moment that the weather allows me to and taking advantage of the gorgeous Spring weather as much as I can. We spent all day Saturday downtown on the National Mall. The Cherry Blossoms hit their peak bloom on Thursday, and we were fortunate to be able to enjoy the blossoms Saturday morning. Then, Saturday afternoon we participated in the Run As One with Team Red, White and Blue, which I’ll fully recap tomorrow. Sunday I spent about an hour outside on a local trail, completing my first “long” run (“long” being 3.84 miles) since last weekend’s Cherry Blossom Ten Mile Run. With not having to work this week, my goal is to be active every single day. When the weather allows, I’ll be outside running and walking, and when it doesn’t I’ll be inside at the gym. Between this goal, as well as working towards my monthly goals, this week seems like the perfect time to add another component to my weekly training log: Monday Motivation. As we kick off another week, let me leave you with my first Monday Motivation here on the blog. The absolutely gorgeous weather that we’ve had here in the DC area inspired my choice for this week’s motivating quote. QOTD: What did you do over the past week to take advantage of Spring weather? 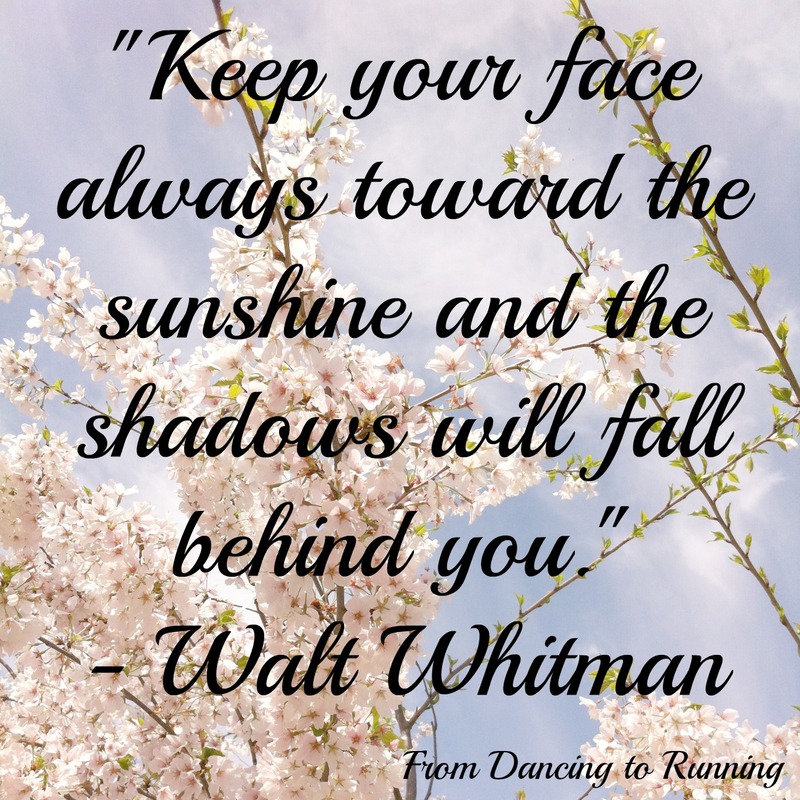 This entry was posted in Motivation, Training and tagged Cherry Blossoms, Monday Motivation, positive thinking, Run As One, running, Team Red White and Blue, treadmill, W&OD Trail, walking, weekly recap, weight training, yoga. Bookmark the permalink. Love the motivation Monday quote. It’s actually one I’ve never seen or heard of before. Thanks for sharing, girl! Glad you like it, Jessie! I’m going to try and start sharing quotes on a weekly basis, so stay tuned for more! There’s nothing better than sunshine and warm weather after the crappy winter that most of us endured this year! It was definitely crowded, but I don’t blame everybody for wanting to head downtown since it was such a perfect day! I ran at noon yesterday and it was 85 degrees outside. I would normally complain but I am so happy for spring that I loved it. I was so sweaty and gross afterwards and it was awesome. Love the quote! And the Cherry Blossoms look gorgeous! We were outside all weekend! We went to an Easter Egg Hunt and then played down by the bay on Saturday. On Sunday we spent the day at the Strawberry Festival and then went to the park. It was a great spring weekend! Sounds like a perfect way to spend your weekend, Mindy. Enjoy your spring break! We got out and played with the dogs! I feel so bad that they’ve been cooped up in the house for so long this winter! I hear ya! We’ve felt the same with our dog as well. This weekend was gorgeous!! You had so many beautiful CB shots on IG, loved they were au natural as well (no filter). I can look at CB pics (and flowers) for days hehe. Look fwd to reading your recap tom. Have a great SB! I have many, many, many more pictures on the camera to download to the computer, and I took a bunch more this afternoon. I absolutely love pics of flowers! I might just have to do an entire post on CB pics! I’m LOVING this weather, it needs to stick around longer! I was able to run an 8K on Sunday and it was just perfect outside. Nothing to kick off a season like new bling and beautiful weather! I couldn’t agree more, Lauren! 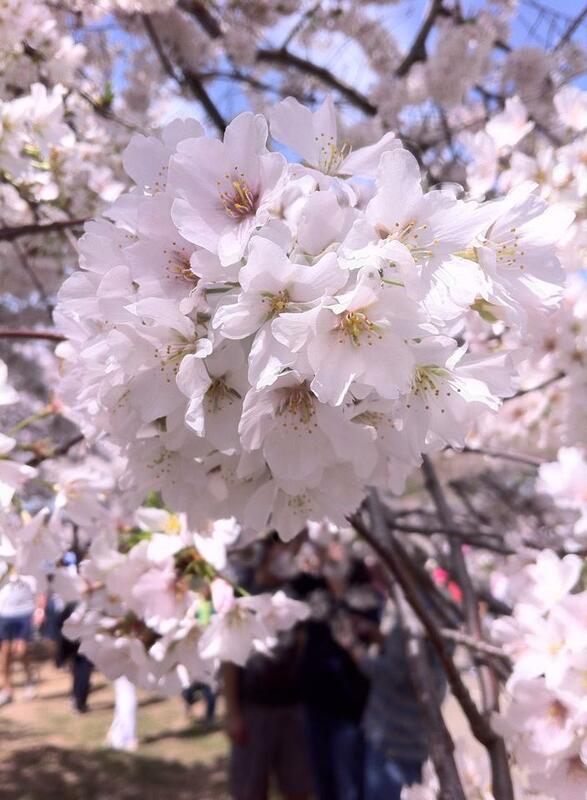 Glad you’re able to take advantage of the gorgeous weather AND the cherry blossoms! Still need to get up there and see them someday.